In the present invention means and method are provided for optimising exon-skipping using exon-internal AON. We show that skipping efficiencies are improved by targeting putative splicing regulatory sequences (ESEs) within an exon. Such double targeting may be particularly useful for exons with which efficient skipping was difficult to obtain prior to the invention. The invention relates to oligonucleotides and equivalents thereof and the use thereof for inducing exclusion of exons from mRNA. Anti-sense technology has developed considerably in recent years. The general field of anti-sense technology can be divided into several areas. One of these area's is the field of exon skipping. In this field, small molecules are added to the cell to specifically interfere with the splicing of one messenger RNA (mRNA) and more specifically, with the incorporation of, or the rather the lack of incorporation of a specific exon in the mature mRNA. In the field of exon skipping, two general approaches can be distinguished. One approach focuses on interfering with enzymatic process of splicing, i.e. the physical joining of exonic sequences. The other approach relies on interfering with the 'logistics' of the splicing process, i.e. the recognition of exons by the splicing machinery. Both approaches use small molecules to obtain the desired effects. The small molecules all share the characteristic of nucleic acids to be able to 'hybridise' to complementary sequences. Examples of such small molecules are, of course, RNA and DNA, and also modified RNA and DNA such as LNA and morpholinos and nucleic acid mimics such as PNA. These molecules are further referred to by the general term small molecules or the more frequently used term anti-sense oligonucleotide (AON). The small molecules are thought to act by hybridising to specific locations on the pre-mRNA. The hybridisation is thought to interfere with either the enzymatic process of splicing or the recognition of exons. At present, exon skipping focuses on the specific exclusion of one or more exons from the mature mRNA. However, it is also possible to redirect the splicing machinery such that other exons are included into the mRNA. This approach is, for instance, of use in genes that are subject to alternative splicing. In these situations, small molecules can be designed redirecting the splicing machinery such that a specific alternative is more efficiently made. providing said cell with a first anti-sense oligonucleotide (AON) that can hybridise to an exon internal part of said exon, and determining whether said efficiency is increased upon providing said cell with a second AON that can hybridise to another exon internal part of said exon. The efficiency increase is preferably determined by comparing the level with the efficiency of either AON alone. The term increased efficiency as used herein refers to the situation wherein (i) the amount of mRNA from which the targeted exon is excluded is higher than with either AON alone, or wherein (ii) the time span within which exclusion of the targeted exon can be detected in said cell is increased or (iii) a combination of both. A method of the invention also provides additional robustness when compared to a method of exon skipping using a single AON. The invention therefore further provides a method for inducing exon skipping in a pre-mRNA that is produced by a cell comprising providing said cell with at least two AON that can hybridise to different exon internal parts of an exon on said pre-mRNA and culturing said cell to allow splicing of said pre-mRNA. A sequence is usually referred to as an exon because the sequence is part of a pre-mRNA that ends up in a mature mRNA. A pre-mRNA contains at least one intron. The first exon contains the cap-site whereas the last exon typically contains the polyA signal. In the present invention exon skipping is preferentially directed to internal exons. An internal exon is any one of exons 2 to exon n-1, wherein n is the total number of exons in said pre-mRNA. When an exon is skipped it is no longer included into a mature mRNA. This feature could be viewed by some as to imply that the sequence is no longer an exon but rather a (part of) an intron. An exon is therefore defined herein as a sequence present in a pre-mRNA, that is incorporated into a mature mRNA by the splicing machinery of the cell that is expressing said pre-mRNA, when said cell is not provided with an AON that induces skipping of said exon. A method of exon skipping in the present invention is therefore also referred to as a method for changing an exonic sequence into an intronic sequence, alternatively, a method of the invention is a method for masking an exonic sequence such that, when masked, said exonic sequence is no longer recognized as an exon by the splicing machinery of a cell. A cell can be provided with an AON in a number of different ways. In a preferred embodiment said AON is provided to said cell by incorporating said AON into a gene delivery vehicle, preferably a liposome. In another preferred embodiment said AON is provided to said cell by means a vector that expresses said AON or a precursor thereof. In a preferred embodiment said vector comprises a viral vector, preferably an adeno-associated virus vector. Thus the invention further provides a gene delivery vehicle comprising at least two exon internal AON specific for the same exon. Using at least two exon internal AON specific for the same exon to skip said exon makes a method of the invention more robust. Moreover, it allows efficient skipping of exons that do not skip efficiently when using only one AON. Without being bound by theory it is believed that an exon-internal AON induces skipping of an exon by hindering the binding of so-called SR (Ser-Arg) proteins that bind to exonic splice enhancer (ESE) sites. In the present invention it was found among others that exons can contain so-called independent ESE sites. This means that when the activity of one ESE site is blocked or hindered by, for instance, the presence of an AON on said exon, another independent ESE on said exon remains functional. As this ESE remains functional, the exon is still efficiently incorporated into the mRNA. This effect can be counteracted by targeting all of the independent ESE sites on said exon. In this case essentially all of the ESE sites are targeted by an AON thereby blocking or hindering binding of SR proteins to said ESE sites which subsequently leads to efficient skipping of the thus targeted exon. Blocking or hindering of an ESE site can be achieved in various ways. For instance, hybridisation of said AON can alter the secondary structure of the exon such that SR proteins can no longer bind to said ESE site. In a preferred embodiment said AON overlaps at least part of a predicted ESE site on the targeted exon. In this way binding of SR proteins to said site is sterically blocked by the hybridisation of said AON thereto. It is preferred that said AON overlaps at least one predicted ESE site. As predicted ESE sites have a tendency to cluster it is preferred that, said AON overlaps at least two and preferably at least three predicted ESE sites on said exon. Thus in a preferred embodiment a hybridisation site of said first AON on RNA of said exon overlaps at least one predicted ESE site on said exon RNA. Preferably, said a hybridisation site of said second AON on said exon RNA overlaps at least one predicted ESE site on said exon RNA. It is not preferred to target said first and said second AON to a single predicted ESE site on said exon RNA. Although this might be the case, it is preferred that said first AON targets a different ESE than said second AON. This can be achieved in various ways. Targeting of the same ESE is preferably avoided by avoiding significant overlap in the hybridisation sites of said AON on said exon RNA. Thus preferably a hybridisation site of said first AON and a hybridisation site of said second AON exhibit less than 5 consecutive nucleotides overlap. More preferably, said sites have less than 3 and more preferably less than 1 or no overlap. Such overlap can easily be avoided by selection of the AON. As an AON of the invention preferably has a linear and continuous hybridisation site on said exon RNA, overlap is preferably avoided by avoiding significant sequence identity in the used AONs. In this respect it is preferred that said first and said second AON have less than 5 consecutive nucleotides sequence identity. Preferably said first and said second hybridisation site on said exon RNA have less than 3 consecutive nucleotides overlap, more preferably less than 2, and preferably less than 1 nucleotide or no overlap. Similarly, said first and said second AON preferably have less than 3 consecutive nucleotides sequence identity, more preferably less than 2 and preferably less than 1 nucleotide sequence identity. In a preferred embodiment said exon comprises at least two independent ESE sites. Said first AON is preferably targeted to at least two independent ESE sites and said second AON to a second thereof. The qualification "sequence identity" as used herein preferably refers to identity using the nucleotides A, C, G or T, wherein T may be replaced by a U. In recent years, many different nucleotide analogues have been generated. Some of these have the same binding characteristics in kind and amount as the mentioned classic or natural nucleotides. However, most of them mimic the binding characteristics in kind but not in amount. In many cases the binding strength of an analogue to the complementary nucleotide is lower than that of the corresponding classical nucleotide. There are also analogues that mimic the binding characteristics of two or more of the classical nucleotides and there are also nucleotide analogues that are incorporated efficiently in a nucleic acid but that do not exhibit significant selectivity for, or binding to, a particular classic nucleotide on the opposing strand. A person skilled in the art is familiar with the particulars of these and similar analogues and can use them in an AON of the invention as long as the AON is capable of hybridising to the hybridisation site on the exon RNA. An AON of the invention preferably comprises between 14-40 nucleotides or analogues thereof. Preferably said AON comprises between 14-25 nucleotides or analogues thereof. An AON of the invention preferably comprises less than 10% nucleotide analogues. An AON preferably comprises less than 4 nucleotide analogues, preferably less than 3, more preferably less than 2. An AON of the invention is preferably a modified oligonucleotide. In a particularly preferred embodiment said AON comprises one or more 2'-O-methyl oligoribonucleotides, which render the AON resistant to RNase H induced degradation of DNA/RNA hybrids. Additionally, a phosphorothiate backbone can be used to increase the stability of AONs against nucleases and to enhance cellular uptake. An AON of the invention has in a preferred embodiment a full length phosphorothioate backbone and all bases (nucleotides) have a 2'-O-methyl modification. Alternatively, morpholino phosphorodiamidate DNA (morpholinos), locked nucleic acids (LNA) and ethylene bridged nucleic acids (ENA) oligos have been used to modulate splicing. An AON of the present invention can therefore also have these modifications. These modifications render the oligos RNase H and nuclease resistant and increase the affinity for the target RNA. For the ENA and LNA modification this increase is accompanied by a decreased sequence specificity. An exon internal part of an exon, is a part that does not exhibit overlap with a 5'- or 3'- end of the exon. A 5'- and 3'-end of an exon contains the sequence information that is relevant for the joining region of the exon. An exon internal part of the exon is at least one and at least two and more preferably at least 5 nucleotides internal to the exon boundary. An exon internal AON may, in addition to the exon internal part as defined herein above, also have nucleotides that extend to the boundary of the exon or beyond. This is however, preferably not the case. A method of the invention preferably further comprises including said first and said second AON in a set of AON when provision of said cell with said second AON increases the efficiency with which said exon is excluded from said mature mRNA in a cell that produces a precursor of said mRNA. Said set is subsequently preferably used to obtain exon skipping in target cells that express said pre-mRNA. The invention also provides a set comprising at least two AON wherein at least a first of said AON can hybridise to an exon internal part of an exon and a second of said AON can hybridise to another exon internal part of said exon. In a preferred embodiment of the invention said set is obtained by a method of the invention. In a particularly preferred embodiment said first and said second of said AON are targeted to ESE sites on said exon RNA. More preferably, said first and said second of said AON are targeted to independent ESE sites on said exon RNA. A set of the invention can be used in many ways. In one embodiment said set is used to at least in part decrease the production of an aberrant protein in a cell. Such proteins can for instance be onco-proteins or viral proteins. In many tumors not only the presence of an onco-protein but also its relative level of expression have been associated to the phenotype of the tumor cell. Similarly, not only the presence of viral proteins but also the amount of viral protein in a cell determines the virulence of a particular virus. Moreover, for efficient multiplication and spread of a virus the timing of expression in the life cycle and the balance in the amount of certain viral proteins in a cell determines the whether viruses are efficiently or inefficiently produced. Using a set of the invention it is possible to lower the amount of aberrant protein in a cell such that for instance a tumor cell becomes less tumorigenic (metastatic) and/or a virus infected cell produces less virus. In a preferred embodiment a set of the invention is used to convert said aberrant protein into a functional protein. In one embodiment said functional protein is capable of performing a function of a protein normally present in a cell but absent in the cells to be treated. Very often even partial restoration of function results in significantly improved performance of the cell thus treated. Due to the better performance, such cells can also have a selective advantage over unmodified cells thus aiding to the effectiveness of the treatment. This aspect of the invention is particularly suited for the restoration of expression of defective genes. This is achieved by causing the specific skipping of targeted exons, thus bypassing or correcting deleterious mutations (typically stop-mutations or frameshifting point mutations, single- or multi-exon deletions or insertions leading to translation termination). Compared to gene-introduction strategies, exon skipping gene therapy requires the administration of much smaller therapeutic reagents, typically, but not limited to, AON comprising or mimicking between about 14-40 nucleotides. In a preferred embodiment AON of 14-25 nucleotides are used since these molecules are easier to produce and enter the cell more effectively. The set of the invention allows more flexibility in the subsequent design of effective and safe exon skipping strategies and/or administration systems. An important additional advantage of a gene function restoring set of AON is that it restores (at least some of) the activity of the endogenous gene, which still possesses most or all of its gene-regulatory circuitry, thus ensuring proper expression levels and the synthesis of tissue-specific isoforms. This aspect of the invention can in principle be applied to any genetic disease or genetic predisposition to disease, in which targeted skipping of specific exons restores the translational reading frame when this has been disrupted by the original mutation. This application is particularly useful when translation of an internally slightly shorter or altered protein is fully or partly functional. Preferred embodiments for which this application can be of therapeutic value are: predisposition to second hit mutations in tumor suppressor genes, e.g. those involved in breast cancer, colon cancer, tuberous sclerosis, neurofibromatosis etc., - where (partial) restoration of activity would preclude the manifestation of nullosomy by second hit mutations and thus would protect against tumorigenesis. Another preferred embodiment involves the (partial) restoration of defective gene products which have a direct disease causing effect, e.g., hemophilia A (clotting factor VIII deficiency, some forms of congenital hypothyroidism (due to thyroglobulin synthesis deficiency) and Duchenne Muscular Dystrophy (DMB), in which frameshifting deletions, duplications and stop mutations in the X-linked dystrophin gene cause severe, progressive muscle degradation. DMD is typically lethal in late adolescence or early adulthood, while non-frameshifting deletions or duplications in the same gene cause the much milder Becker muscular dystrophy (BMD), compatible with a life expectancy between 35-40 y to normal. In the embodiment as applied to DMD, the present invention enables exon skipping to extend an existing deletion (or alter the mRNA product of an existing duplication) by as many adjacent exons as required to restore the reading frame and generate an internally slightly shortened, but still functional protein. Based on the much milder clinical symptoms of BMD patients with the equivalent of this induced deletion, the disease in the DMD patients would have a much milder course after AON-therapy. Considering the many clinical uses of sets of the invention, a method of the invention preferably further comprises providing said set to a human cell. In one embodiment, the invention provides a set of AON obtainable by a method of the invention. 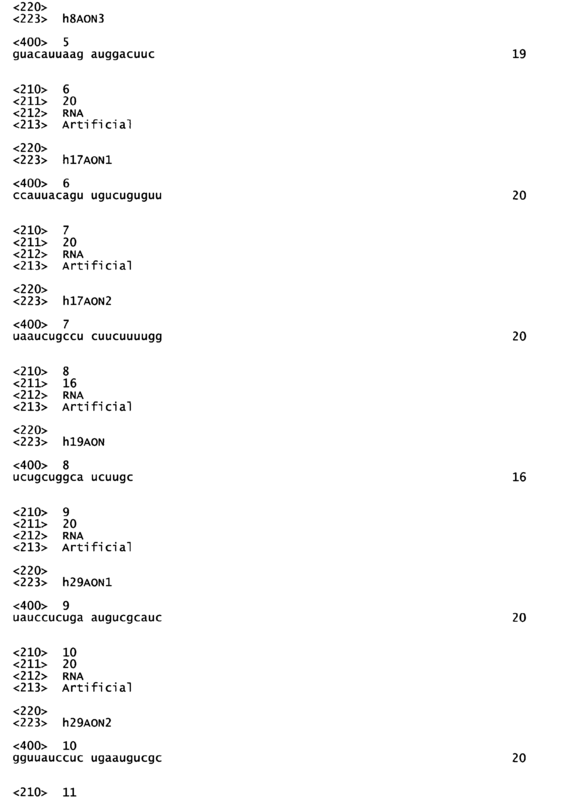 In a preferred embodiment said set comprises at least one AON of table 1 or table 2. In a preferred embodiment the invention provides a set comprising at least AON of table 1 and/or table 2. 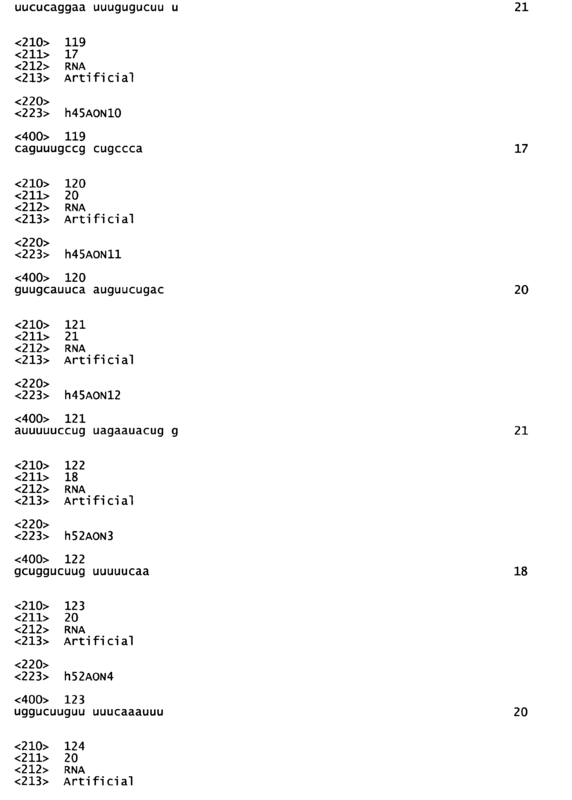 In a preferred aspect of this embodiment said set of at least two AON of table 1 and/or table 2 comprises h2AON1 and h2AON3, h43AON1 and h43AON2, h43AON1 and h43AON3, h43AON1 and h43AON4, h43AON1 and h43AON5, h43AON2 and h43AON5, h43AON3 and h43AON5, h43AON4 and h43AON5, h45AON1 and h45AON4, h45AON1 and h45AON5, h45AON1 and h45AON9, h45AON2 and h45AON3, h45AON2 and h45AON4, h45AON2 and h45AON5, h45AON3 and h45AON4, h45AON3 and h45AON5, h45AON3 and h45AON9, h45AON4 and h45AON5, h45AON5 and h45AON9, h46AON4 and h46AON8, h46AON4 and h46AON20, h46AON4 and h46AON22, h46AON6 and h46AON21, h46AON8 and h46AON22, h46AON8 and h46AON23, h46AON8 and h46AON26, h46AON9 and h46AON21, h46AON9 and h46AON22, h46AON9 and h46AON26, h46AON22 and h46AON24, h46AON24 and h46AON26, h47AON1 and h47AON3, h47AON1 and h47AON5, h47AON2 and h47AON3, h47AON2 and h47AON5, h47AON3 and h47AON4, h47AON3 and h47AON5, h47AON3 and h47AON6, h47AON4 and h47AON5, h47AON5 and h47AON6, h48AON1 and h48AON4, h48AON1 and h48AON6, h48AON1 and h48AON8, h48AON1 and h48AON9, h48AON1 and h48AON10, h48AON2 and h48AON10, h48AON3 and h48AON4, h48AON4 and h48AON6, h48AON6 and h48AON8, h48AON6 and h48AON9, h48AON6 and h48AON10, h48AON7 and h48AON9, h57AON1 and h57AON3 and/or h57AON2 and h57AON3. In a preferred embodiment said set of at least two AON of table 1 and/or table 2 comprises h43AON1 and h43AON3, h45AON1 and h45AON4, h45AON1 and h45AON5, h45AON1 and h45AON9, h45AON2 and h45AON3, h45AON2 and h45AON4, h45AON3 and h45AON4, h45AON3 and h45AON5, h45AON3 and h45AON9, h45AON4 and h45AON5, h45AON5 and h45AON9, h46AON9 and h46AON21, h47AON1 and h47AON3, h47AON1 and h47AON5, h47AON2 and h47AON3, h47AON2 and h47AON5, h47AON3 and h47AON4, h47AON3 and h47AON5, h47AON3 and h47AON6, h47AON4 and h47AON5, h47AON5 and h47AON6, h48AON1 and h48AON4, h48AON1 and h48AON8, h48AON3 and h48AON4, h57AON1 and h57AON3, h57AON2 and h57AON3. In a particularly preferred embodiment said set of at least two AON of table 1 and/or table 2 comprises h45AON1 and h45AON4, h45AON1 and h45AON5, h45AON1 and h45AON9, h45AON2 and h45AON3, h45AON3 and h45AON4, h45AON3 and h45AON5, h45AON3 and h45AON9, h45AON4 and h45AON5, h45AON5 and h45AON9, h47AON1 and h47AON3, h47AON1 and h47AON5, h47AON2 and h47AON3, h47AON2 and h47AON5, h47AON3 and h47AON4, h47AON3 and h47AON5, h47AON3 and h47AON6, h47AON4 and h47AON5, h47AON5 and h47AON6, h57AON1 and h57AON3, h57AON2 and h57AON3. The present invention further provides an AON of table 2. Preferably, said AON of table 2 is h33AONl, h33AON2, h44AON3, h44AON4, h45AON11 or h52AON3. In one aspect the invention further provides a method for the treatment of an individual suffering from a tumor, a virus infection and or a genetic disease and/or genetic predisposition, comprising administering a set of AON of the invention to said individual. The invention further provides a pharmaceutical composition comprising a set of AON according to the invention. Preferably said set is used for the treatment of an individual suffering from a tumor, a virus infection and or a genetic disease and/or genetic predisposition. Preferably, said set is used for the treatment of Duchenne Muscular Dystrophy (DMD). The invention also provides a cell that produces an exon containing precursor of an mRNA, wherein said cell comprises a first AON that can hybridise to an exon internal part of said exon, and a second AON that can hybridise to another exon internal part of said exon. We hypothesized that by targeting multiple ESEs within one exon, skipping efficiencies might be increased for exons that could not be skipped at high levels using individual AONs. 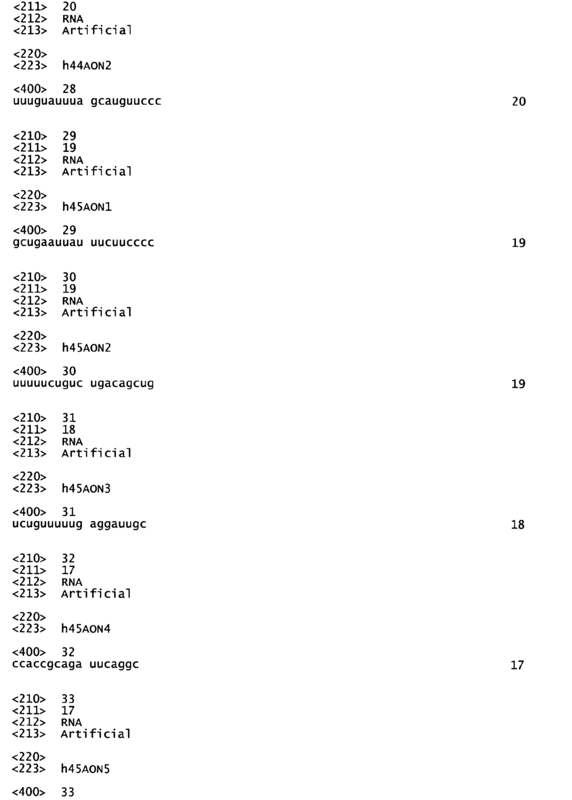 The relative locations of the AONs to putative ESEs (as predicted by ESEfinder) are depicted for each of these exons in Fig. 1A. Supplementary Table 1). 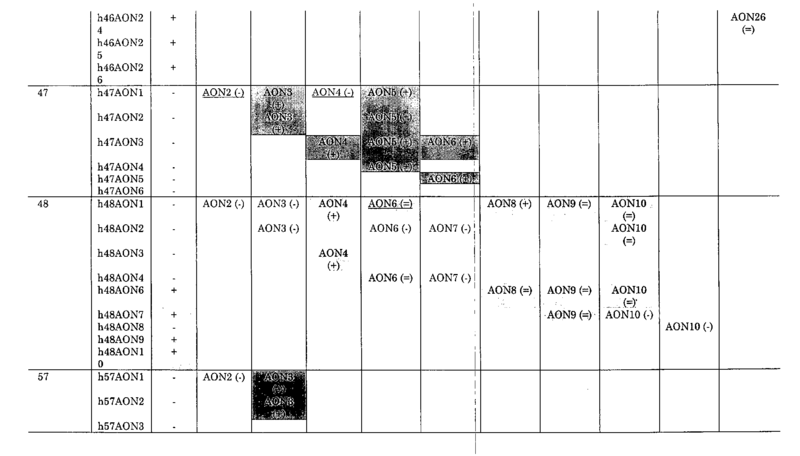 Interestingly, for exon 47 only combinations of non-overlapping AONs induced exon skipping, while those that do overlap were ineffective (Supplementary Table 1). Similarly, for exon 57 the combination of AONs that nearly overlap (h57AON1 and 2) did not induce exon skipping. 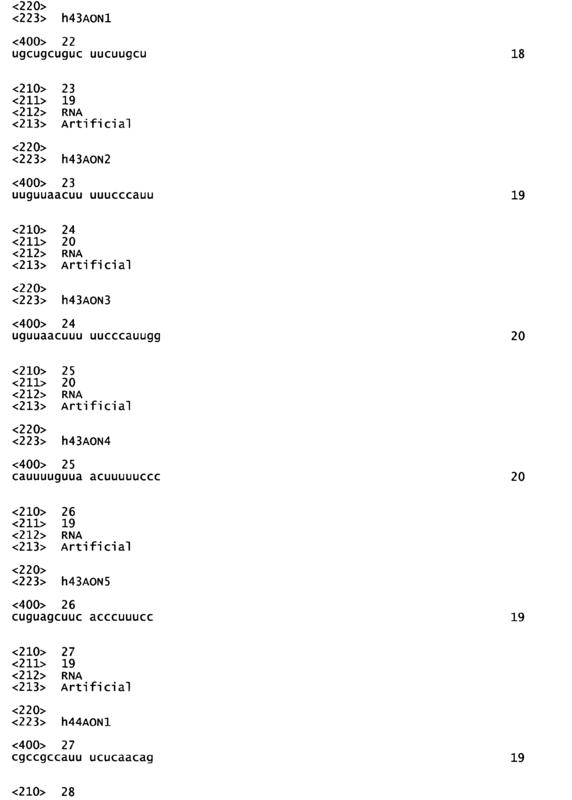 This fits with our hypothesis that two mutually exclusive ESE sites are present in these exons. For both exon 2 and exon 45 only a single AON reproducibly induced low levels of exon skipping (h2AON1 and h45AON5, respectively). Considerably higher levels of exon 45 skipping could be induced by combining the effective h45AON5 with ineffective AONs, as well as by combining two individually ineffective AONs (e.g. h45AON3 and h45AON9) (Fig. ID). Thus for this exon two effective ESEs are likely to be present as well. In contrast, combinations of AONs did not increase skipping efficiencies for exon 2. In fact, combining the effective h2AON1 with the ineffective h2AON2 abolished exon 2 skipping (Fig. 1E). This interference was not observed for a combination of h2AON1 with h2AON3 (which overlaps less than h2AON2). For exons 43 and 48, effective AONs induced only moderate levels of skipping. 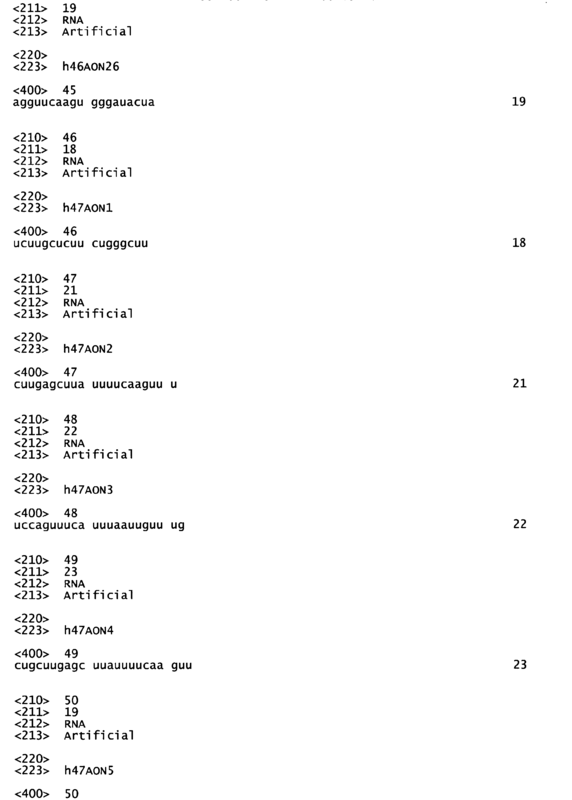 For these exons the skipping levels could not be increased by using combinations of AONs (Supplementary Table 1). In these exons three or even more ESEs may be present. Therefore, we targeted exon 48 with a combination of 3 different AONs, which still did not improve skipping levels. Thus, it seems more likely that the splicing of this exon is largely independent of ESE sites. This is supported by the fact that the splice sites predicted are perfect (3' splice site) or near perfect (5' splice site) and that only a few ESEs are predicted for exon 48. Finally, we used combinations of exon 46 specific AONs, some of which were already very efficient individually. We aimed to increase skipping levels to (near) 100%. However, none of the combinations used further improved skipping levels when compared to single targeting (Supplementary Table 1). This indicates that blocking one ESE site is sufficient to perturb the correct splicing of this exon. It is possible that the ESE sites of this exon are dependent on each other, so that by blocking one, more or all ESEs are inactivated. Alternatively, the secondary structure of the pre-mRNA may be changed upon AON binding so that the other ESE sites are no longer available for SR protein binding. Interestingly, once more (partly) overlapping combinations appeared to negatively interfere with the individual exon skipping capacities, irrespective of whether the single AONs were effective or ineffective. It was expected that combinations of two ineffective, overlapping AONs would also be ineffective, since they either both target no functional ESE site or both target the same of two (or more) mutually exclusive ESE sites. For combinations of overlapping, effective AONs this finding was unexpected. It is possible, however, that these AONs compete with each other, and force one another to detach from the target transcript in a dynamic process, thereby making the target site available again for SR proteins. Upon binding SR proteins will recruit other splicing factors to the splice sites, and thus enhance exon inclusion rather than exon skipping. 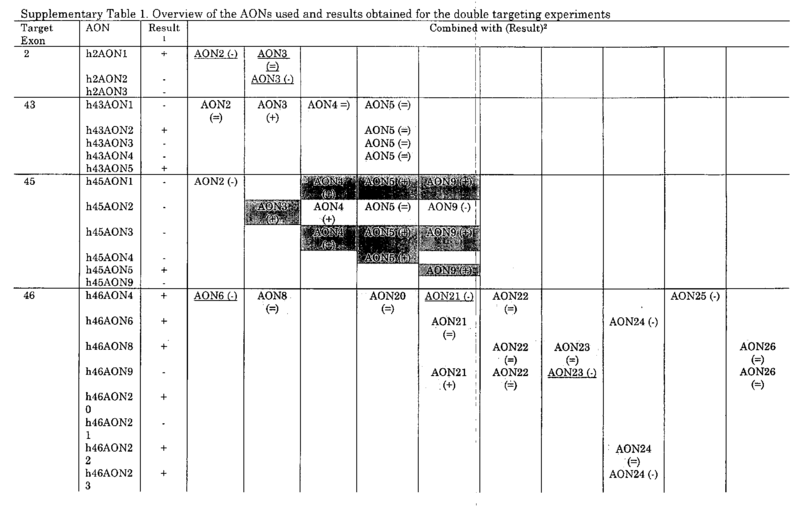 All AONs used for the double targeting experiments were previously described (see Supplementary Table 1) ((11, 14, 15). All AONs contain 2-O-methyl RNA, phosphorothioate backbones and 5' fluorescein labels and were manufactured by Eurogentec (Belgium). (RT-) PCR primers were chosen in exons flanking the skipped exons (Eurogentec, Belgium; sequences available upon request). Figure 1. Double targeting. (A). Relative locations of AONs and putative ESE sites within exons 2, 43, 45-48 and 57. Exons and AONs are drawn to scale as lines for each exon. Putative binding sites of SF2/ASF, SC35, SRp40 and SRp55 as predicted by ESEfinder are depicted as boxes at their respective locations. (B-E). Some examples of RT-PCR analysis after double targeting experiments. (BC). For exons 47 and 57 none of the available AONs reproducibly induced exon skipping. Using combinations of these AONs, however, exon 47 and 57 skipping was reproducibly induced at significant levels. For exon 57 combinations containing h57AON3 were most efficient, while for exon 47 all non-overlapping combinations induced comparable levels of exon 47 skipping. In some cases an additional band could be observed in the exon 47 PCR, which was slightly shorter than the wild type product. This band was not reproducible, was observed both in treated and non-treated samples, and appeared to be an a-specific PRC product containing DMD exons 72-74. (D). For exon 45 only one of the available AONs reproducibly induced skipping, albeit at low levels (h45AON5). Very low levels of exon skipping were occasionally observed for h45AON1 and h45AON4, but this was not reproducible. Exon 45 skipping could be achieved at much higher levels using combinations of AONs. The highest levels of exon 45 skipping were observed for combinations of h45AON5 and h45AON1 or h45AON3 and for h45AON1 and h45AON9. In contrast, a mixture of the overlapping h45AON2 and h45AON9 was ineffective. (E). For exon 2 only overlapping AONs were available. When the effective h2AON1 was combined with the ineffective, overlapping h2AON2, no skipping could be induced. This effect was not seen when h2AON1 was combined with the ineffective, less overlapping h2AON3. The sequence of the mentioned AON is given in article Aartsma-Rus A, et al. (2005). Functional analysis of 114 exon-internal AONs for targeted DMD exon skipping: indication for steric hindrance of SR protein binding sites. 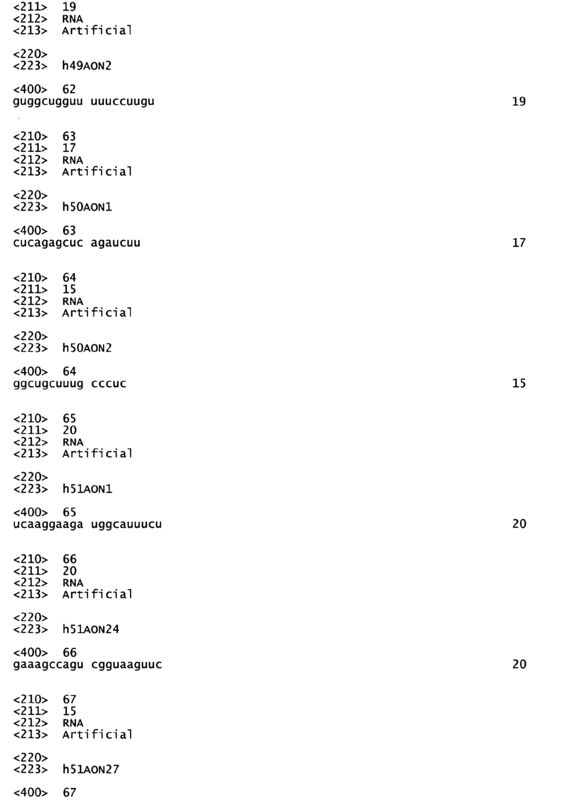 Oligonucleotides 15: 284-297. NT is non transfected, -RT is negative control, M is 100 bp size marker. 1. Emery AE. (2002). The muscular dystrophies. Lancet 359: 687-95. 2. Monaco AP, Bertelson CJ, Liechti-Gallati S, Moser H, and Kunkel LM. (1988). An explanation for the phenotypic differences between patients bearing partial deletions of the DMD locus. 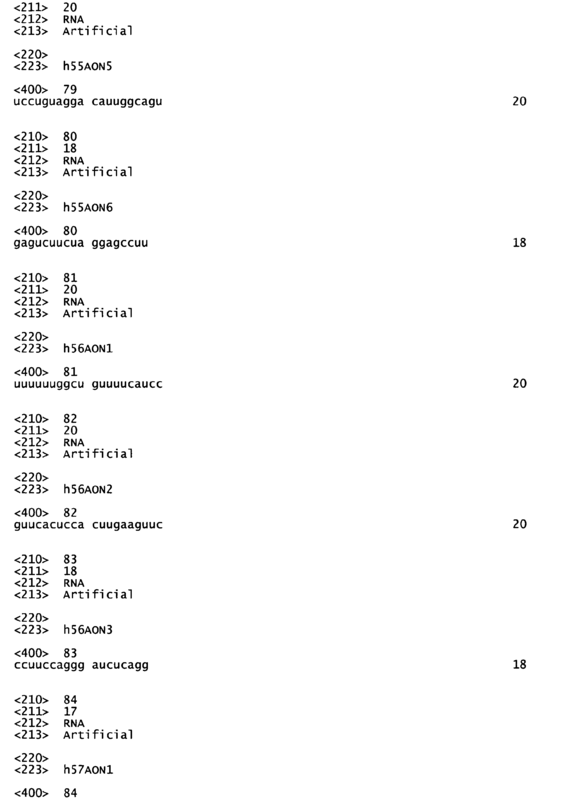 Genomics 2: 90-95. 3. 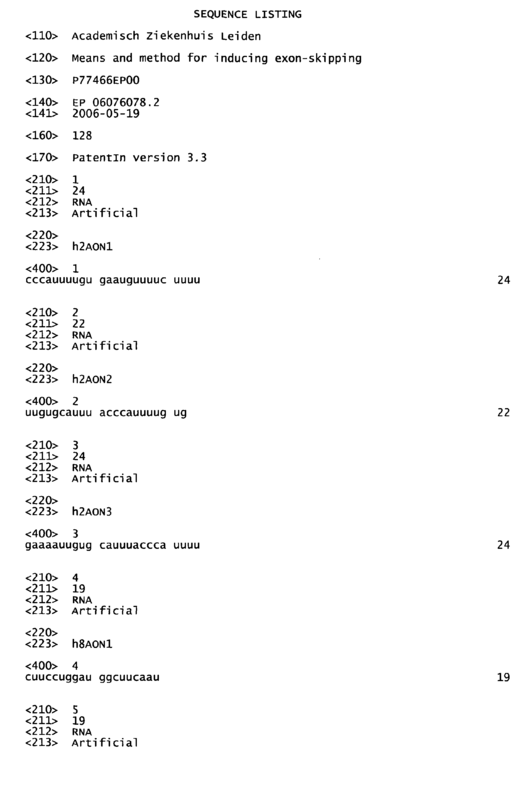 Hoffman EP, et al. (1988). Characterization of dystrophin in muscle-biopsy specimens from patients with Duchenne's or Becker's muscular dystrophy. N Engl J Med 318: 1363-1368. 4. Koenig M, Hoffman EP, Bertelson CJ, Monaco AP, Feener C, and Kunkel LM. (1987). Complete cloning of the Duchenne muscular dystrophy (DMD) cDNA and preliminary genomic organization of the DMD gene in normal and affected individuals. Cell 50: 509-517. 5. Yoshida M, and Ozawa E. (1990). Glycoprotein complex anchoring dystrophin to sarcolemma. J Biochem (Tokyo) 108: 748-752. 6. Hoffman EP, Brown RH, Jr., and Kunkel LM. (1987). Dystrophin: the protein product of the Duchenne muscular dystrophy locus. Cell 51: 919-928. 7. Lu QL, et al. (2003). Functional amounts of dystrophin produced by skipping the mutated exon in the mdx dystrophic mouse. Nat Med 8: 1009-1014. 8. van Deutekom JC, and van Ommen GJ. (2003). Advances in Duchenne muscular dystrophy gene therapy. Nat Rev Genet 4: 774-783. 9. Aartsma-Rus A, et al. (2003). Therapeutic antisense-induced exon skipping in cultured muscle cells from six different DMD patients. Hum Mol Genet 12: 907-914. 10. van Deutekom JC, et al. (2001). Antisense-induced exon skipping restores dystrophin expression in DMD patient derived muscle cells. Hum Mol Genet 10: 1547-1554. 11. Aartsma-Rus A, et al. (2004). Antisense-induced multiexon skipping for duchenne muscular dystrophy makes more sense. Am J Hum Genet 74: 83-92. 12. Bremmer-Bout M, et al. (2004). Targeted Exon Skipping in Transgenic hDMD Mice: a Model for Direct Pre-clinical Screening of Human-specific Antisense Oligonucleotides. Molecular Therapy 10: 232-240. 13. Lu QL, et al. (2005). Systemic delivery of antisense oligoribonucleotide restores dystrophin expression in body-wide skeletal muscles. Proc. Natl. Acad. Sci. U.S.A. 102: 198-203. 14. Aartsma-Rus A, Bremmer-Bout M, Janson A, Den Dunnen J, van Ommen G, and van Deutekom J. (2002). Targeted exon skipping as a potential gene correction therapy for Duchenne muscular dystrophy. Neuromuscul Disord 12: S71-S77. 15. Aartsma-Rus A, et al. (2005). Functional analysis of 114 exon-internal AONs for targeted DMD exon skipping: indication for steric hindrance of SR protein binding sites. 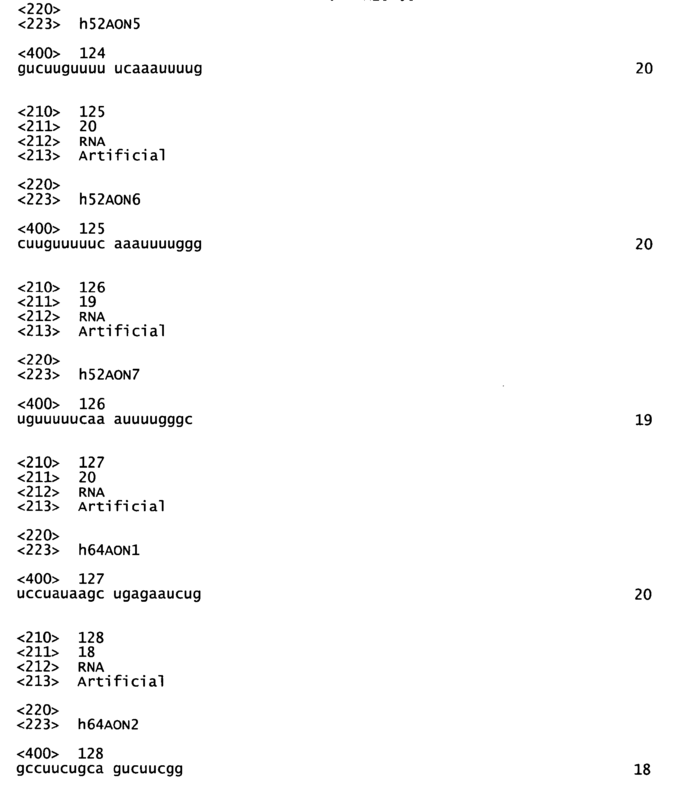 Oligonucleotides 15: 284-297. 16. Stojdl DF, and Bell JC. (1999). SR protein kinases: the splice of life. Biochem Cell Biol 77: 293-298. 17. Fokkema IF, den Dunnen JT, and Taschner PE. (2005). LOVD: easy creation of a locus-specific sequence variation database using an "LSDB-in-a-box" approach. Hum. Mutat. 26: 63-68. 18. England SB, et al. (1990). Very mild muscular dystrophy associated with the deletion of 46% of dystrophin. Nature 343: 180-182. 19. Mirabella M, et al. (1998). Giant dystrophin deletion associated with congenital cataract and mild muscular dystrophy. Neurology 51: 592-595. 20. Bushby KM, Appleton R, Anderson LV, Welch JL, Kelly P, and Gardner-Medwin D. (1995). Deletion status and intellectual impairment in Duchenne muscular dystrophy. Dev Med Child Neurol 37: 260-269. 21. Tennyson CN, Klamut HJ, and Worton RG. (1995). The human dystrophin gene requires 16 hours to be transcribed and is cotranscriptionally spliced. Nat Genet 9: 184-190. 22. Havenga MJ, et al. (2002). Exploiting the natural diversity in adenovirus tropism for therapy and prevention of disease. J Virol 76: 4612-4620.
providing said cell with a first anti-sense oligonucleotide (AON) that can hybridise to an exon internal part of said exon, and determining whether said efficiency is increased upon providing said cell with a second AON that can hybridise to another exon internal part of said exon. A method according to claim 1, wherein a hybridisation site of said first AON and a hybridisation site of said second AON exhibit less than 5 nucleotides overlap. A method according to claim 1 or claim 2, wherein a hybridisation site of said first AON on RNA of said exon overlaps a predicted exonic splicing enhancer (ESE) site on said exon RNA. A method according to any one of claims 1-3, wherein a hybridisation site of said second AON on RNA of said exon overlaps a predicted ESE site on said exon RNA. A method according to any one of claims 1-4, wherein said exon comprises at least two independent ESE sites. A method according to any one of claims 1-5, further comprising including said first and said second AON in a set of AON when provision of said cell with said second AON increases the efficiency with which said exon is excluded from said mature mRNA in a cell that produces a precursor of said mRNA. A method according to claim 6, further comprising providing said set to a human cell. A set of AON obtainable by a method according to claim 6 or claim 7. A set of AON according to claim 8, comprising at least one AON of table 1 or table 2. An AON of table 2. A cell that produces an exon containing precursor of an mRNA, wherein said cell comprises a first AON that can hybridise to an exon internal part of said exon, and a second AON that can hybridise to another exon internal part of said exon. 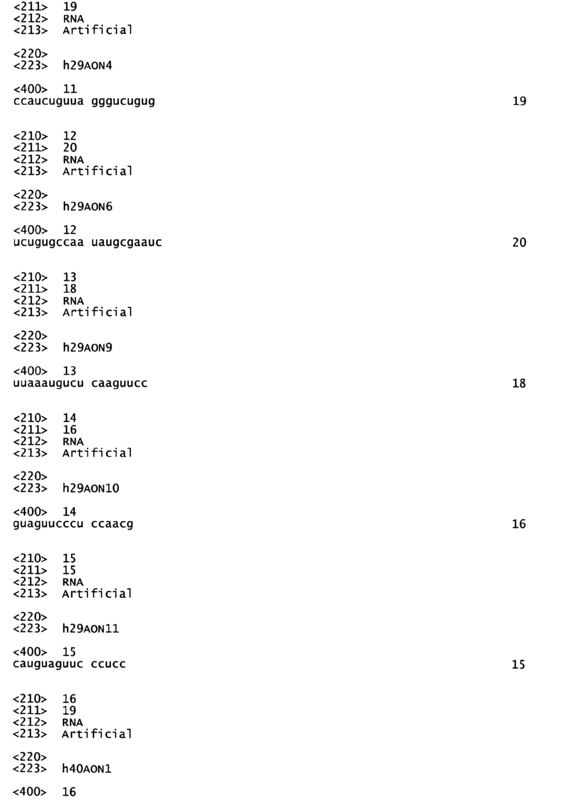 WO2010050802A2 (en) * 2008-10-27 2010-05-06 Academisch Ziekenhuis Leiden Methods and means for efficient skipping of at least one of the following exons of the human duchenne muscular dystrophy gene: 43, 46, 50- 53. 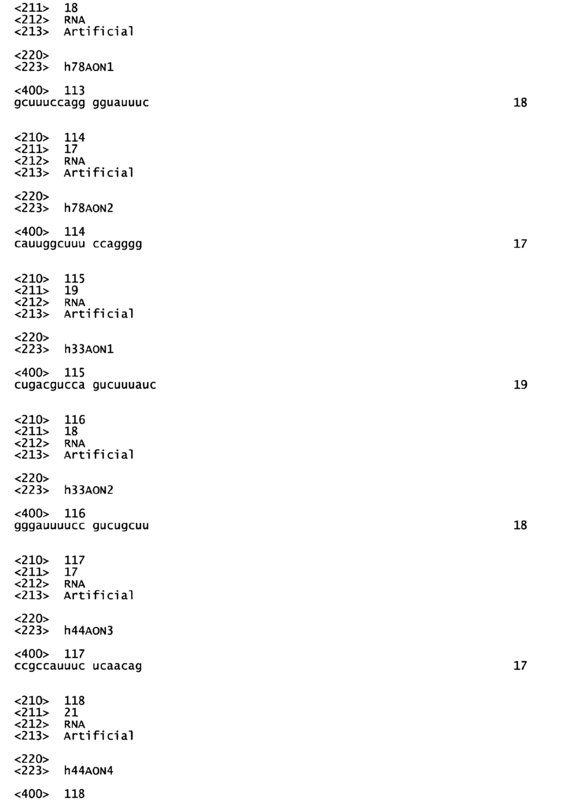 CN102256606A (en) * 2007-10-26 2011-11-23 普绕申萨公司 Methods and means for efficient skipping of at least one of the following exons of the human duchenne muscular dystrophy gene: 43, 46, 50- 53. FR2675803B1 (en) 1991-04-25 1996-09-06 Genset Sa Oligonucleotides farms, antisense and sense and their applications. AU2009310558A8 (en) * 2008-10-27 2015-01-22 Academisch Ziekenhuis Leiden Methods and means for efficient skipping of at least one of the following exons of the human Duchenne muscular dystrophy gene: 43, 46, 50- 53. 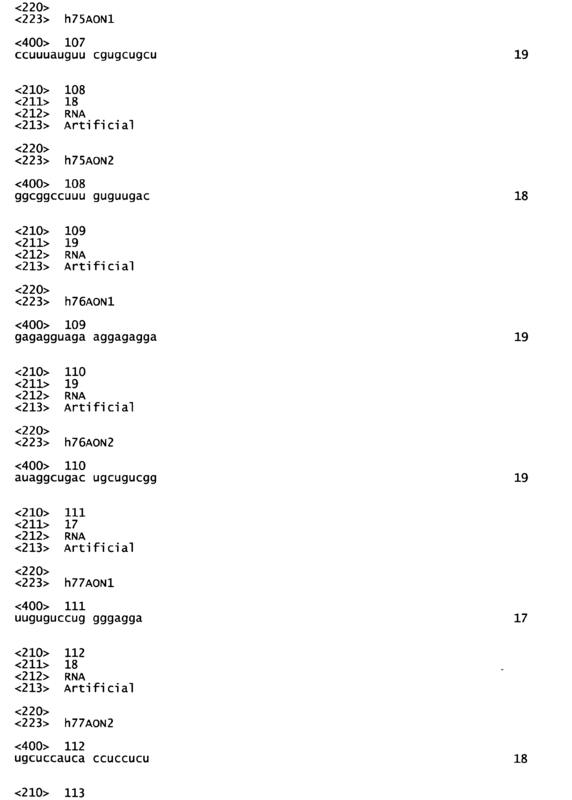 WO2010050802A3 (en) * 2008-10-27 2010-08-12 Academisch Ziekenhuis Leiden Methods and means for efficient skipping of at least one of the following exons of the human duchenne muscular dystrophy gene: 43, 46, 50- 53. AU2009310558B2 (en) * 2008-10-27 2014-09-04 Academisch Ziekenhuis Leiden Methods and means for efficient skipping of at least one of the following exons of the human Duchenne muscular dystrophy gene: 43, 46, 50- 53. Takeshima et al. 1995 Modulation of in vitro splicing of the upstream intron by modifying an intra-exon sequence which is deleted from the dystrophin gene in dystrophin Kobe.